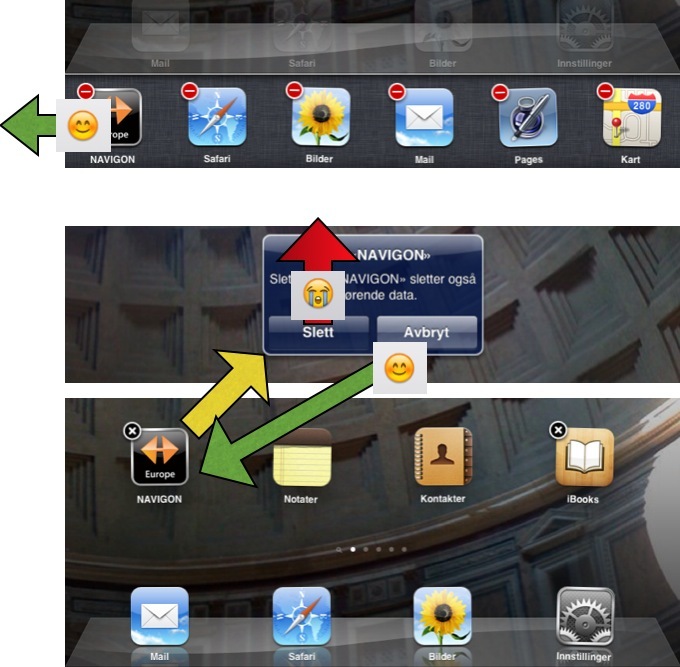 This blog lists some random experience with using an iPad2 in Italy in the summer of 2011. The iOS version was 4.3.3. Some if these experiences may be of interest to others.. I did try paining water colour (aquarelle) again on this visit. Sitting at the spot to draw and paint feels most artistic. However, as the light and shadows, and indeed colours change, it's easy to shoot a picture and use it to paint off-spot. I took the picture and imported it to the iPad. More about this import scheme later; it does have some peculiar functionality. Apple surely has listened to my feedback below and made this possible.. It's so much easier to draw the picture to paper if we have a grid. A long arm and the thumb on a pencil is difficult with and iPad. With the iPad and its 4/3 ratio screen, a 4x3 grid is enough. I did not succeed making this in the iPad while the paint was wet, so I taped dental floss on the iPad! It worked, but was not very practical when touch was again needed. 1. In Apple Pages, make a 4x3 table, with size 16 x 12 cm or as close as you can get. Save it. Turn the iPad to landscape and make the table as big as possible. 2. Take s screen shot (Home and On/Off buttons simultaneously). It is saved in Camera Roll. 3. Open ArtStudio. Load this screen cut from Camera Roll. Crop it. Rescale it to 2048x1536 since this is the internal format that ArtStudio "likes" best. Don't keep aspect ratio, as the table you made in Pages may not be accurately 4/3. Now smart-select (use magic wand) one square (512x512) and clear the contents. This makes it transparent. Do this 12 times. Now you have a 4x3 transparent grid. Save it to the Camera Roll. 4. In ArtStudio, load the picture you want to paint. Make a new layer, and insert the just saved picture in that layer. Save it. Congratulations, you don't need the dental floss any more for this stuff! I have informed Lucky Clan (http://www.iphoneclan.com/artstudio/) about this - as having a built-in function would have been much nicer. I have also informed Apple (http://www.apple.com/feedback/iphone.html), as a magical "display picture with grid" would have been great! Or maybe there already is an app for this? I have not found any way for Pages to put pictures as table background. By the way, the picture is from San Gimignano. Also, I did not want to transform the picture inside ArtStudio to make a computer water colour. Would have been nice, but not this time. This problem is as simple to describe as the iOS solution is too simple. The first night we imported the first day's new pictures from the camera. Some were good, some were deleted. We had created one first day photo event. ("hendelse" in Norwegian.) Good! The next day we imported the second day's pictures from the camera. We were asked if we wanted to import the duplicates. Good. We answered no. We had one second day event. Good! But the pictures we deleted day one were put into a second first day event. This is not what we wanted! The third day I understood the problem: it's not possible to delete on the iPad alone! 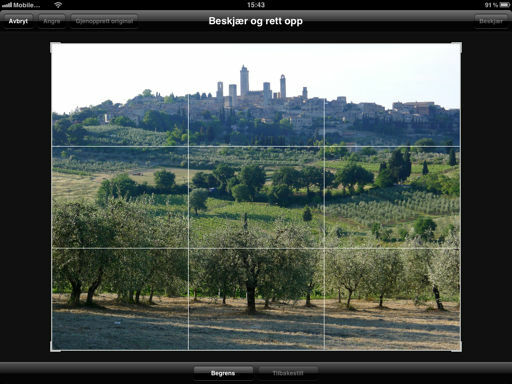 If a picture is deleted from the iPad, it must also be deleted from the camera. However, since that picture had indeed been taken, and today's cameras have enough memory to keep everything for a week or four, having a backup of iPad's deleted pictures in the camera would have been nice. There could be several ways to implement this. I have some ideas, but I trust Apple to solve this. Only observe, there could be (like) two cameras to import from. An additional problem is then if there should be(like) two first day events or one joined? I have informed a Navigon support mail address about this blog. We were using Navigon 1.8.2. We did 1. as told and went up the yellow road. It discovered we were wrong and correctly took us back to the roundabout coming in on Via Galileo Galilei, the white road. It then told us to take the second road, which was correct. But it still asked us to take the third in the final roundabout. If Navigon is right, then it did not count the white road coming into the first roundabout - but it did count the north white road in the second. Disclaimer: I don't really know if the map corresponds 100% with the roads, but I think so. Only going to first entry of route? I think a Navigon "route" is a list of targets that we can only jump into at one place: the first entry. So, if you have made San Gimignano, no special street, the first entry in the route nad want to go from "here" there is a danger that you'll use 15 minutes trying to reach the first entry from here, like telling Navigon to to go from home to some neighbour. It's made for this kind of stuff, but the Navigon people could probably detect this, and ask me if I wanted to go to the first or second entry in the route. And then next time, I could tell it to go from here to the third entry. And then I would not have to cut off the next goal once I've got there. 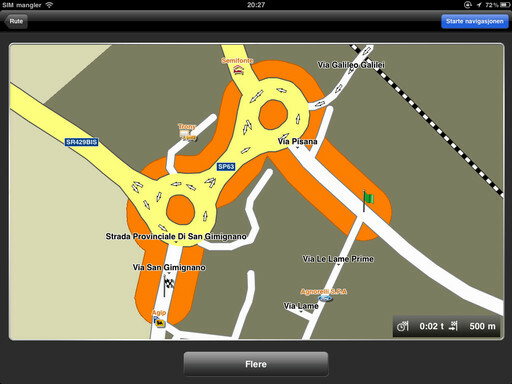 Maybe this is not what Navigator software is about, maybe others have this, and maybe even Navigon has it? Bare with me: I am new to this! There were obvious map errors, mosty associated with temporary changes. NAVTEQ certainly has some work to do there. Navigon contains no help whatsoever(?). Touch is not logical, it has to be learnt. Swiping! One, two, three or even more fingers. There is some common reaction to them among apps, but I'd certainly like to know from day one, or minute one, how they are used by Navigon. Tip for Navigon: download ArtStudio. They have a single help screen called "Quick tutorial" and courses called "Lessons". Some times Navigon crashed and we had to restart, like once every two hours. It came back to where we were, but I certainly hope that Navigon has asked iOS to ask me to send crash logs back to them. Once simulation hung and Navigon did not respond. What I then did was terrible, next chapter. Have a look at this note: 028 - DIY prototype of an iPad 2 holder for car glove compartment. The bottom chapter there also comments on Navigon and the car's built-in navgiation. Then I decided that this was partly Apple's fault, even if I hadn't done my homework (stay tuned). I was tired and pressed buttons in a frenzy when my fingers took the wrong path between wobbling icon with a red minus (top in figure, to kill or stop a program) and a wobbling icon black cross (bottom in figure, to remove a program and its data) makes all the difference. Navigon was hanging, and I wanted to stop the thing. I should have taken the top path in the figure above, but it's difficult to get there: 1.) While the misbehaving app is running I have to double-tap the home button get to the running process list, 2.) I have to start another application, 3.) I have to double-tap again to get the running process list again, 4.) I have to hold the icon of the app which I want to kill (because only now it appears in the list) so they all start wobbling and then 5.) tap the cross, and that's it. No problem. Green arrow. Can't go wrong because it only stops the app. However, the mere complexity of the procedure above is so, that when you know how to do it, you do it cognitively without the brain. It's called routine. Navigon was hanging, and I wanted to stop it. But at that time I chose the wrong path (which is much simpler than the above. Yes, simpler to get to the dangerous thing than the ok thing). A.) I pressed the home button once, B.) I held the icon until it started wobbling and then, C.) I had to answer something in a query box, either D.1) Yes I want to delete the application and all its data or D.2) No I don't. I pressed Yes. Red arrow: very stupid. Good for us that Navigon wasn't showing us the way to a hospital. However, my home work should have been to set restrictions, which would have stopped my ability to remove a program! The black crosses simply won't appear no matter how long I hold an icon. See figure below. I had thought this was something that parents did with a kid's iDevice. Now I understand that it's certainly something I should have done to protect myself from my own stupid actions. And from Apple's elegant but dangerous route - even if by design. For our case it really wasn't so bad, though. I had also installed Navigon on my wife's 3GS, and we could happily drive on. And the hotell we arrived at in Urbino, Italy, had internet access included. Up with AppStore on the iOS, and a new almost 2 GB download. It's perfect that one purchase covers several machines, and that Navigon exists for both machines! But Apple - the whole of Navigon was probbaly still silently present in the iOS flash-based memory. How about just asking me if I wanted to wake up the just deleted app? I don't know if the iOS file system has a recycle bin internally, but the functionality would have been nice! Or a third choice to removal, yes, cancel or stack (move to some kind of iOS special recycle mechanism?). Usually it works surprisingly well to connect iPhone, iPod or iPad to a new router. However at one of the hotels we experienced problems with mail. Browsing with Safari (and Opera) worked fine. But sending and receiving mail with the iOS mail client failed. More detailed: sending always failed, bet reception a very few times seemed to work. We brought one iPad2 (iOS 4.3.3), one iPhone 3G (iOS 4.2.1) and one 3GS (iOS 4.3.1) - but I only experimented on the iPad. I think one.com and the router in mind together displayed the problem. Not only the Mail client, but even Safari webmail was not able to log in to my one.com account. Opera Mini webmail with one.com logged me in and I could read mail and also send (see below). We had one ingoing IMAP server connected, and up to three outgoing SPMT servers. Any combination of these did not seem to help. The strange thing is that I wasn't able to set up Gmail in iOS Mail either, even if it's more or less automatic and built-in. Another strange thing: why did the lady I asked, sitting with an iPad, have functional mail, in the same hotel? "Setting up iPhone Mail/iPod Touch" help on one.com: http://www.one.com/en/support/guide/mail/setting-up-iphone-mail. This is not updated with iPad, which is a shame. They don't support home page editing for Mac either, any type - Mac OSX or iOS. Another shame. The Opera Mini was version 6.0.0.13548. One.com webmail did work to some extent with the particular router, mentioned above. But there are some points, most of them disregarding the fact of the router, I would assume. Opera Mini could only handle one session "per Opera". Different windows were not able to have different log-ins or sessions. This mixed up the webmail lists, which pointed to the last log-in list. So, if my wife logged in in one window, and I was already logged in in another - when I came back to mine and pressed mail #3, it confused that with entries in her list. As when using iOS Safari at home (or at the other hotels) webmail sending of file attachments does not work. Both browsers would know perfectly well that this browser is for iOS, so giving me a possibility to browse pictures should have been piece of cake. Opera Mini hindered me editing the file input line, which proves that they knew it is of little use. Opera Mini let med pick out the Send text from the Send button, as if that is of any interest. Opera Mini could not show pictures in mails.